You Can Conquer Your Own Sleep Apnea and Associated Chronic Insomnia | With NO CPAP, NO DRUGS, NO SURGERY, and NO EXPENSIVE DENTAL DEVICES! SLEEP APNEA is a very serious medical problem. Radio and TV advertisements abound in this day and age touting all sorts of means for treating it. Suddenly, everybody is talking about it. You may not need a CPAP or oral appliance! The most important thing is not to get this disease in the first place! Conquering Your Own Sleep Apnea The All-Natural Way (582 pp.) 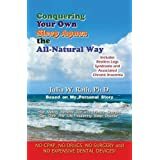 is a paradigm-shattering book based in part on the experiences of the author, Julia W. Rath, Ph.D., and her struggle to overcome this dreadful sleep disorder. By teaching you the same techniques of self-observation and self-analysis–and above all, changes in diet and lifestyle–that she developed for herself, this book is meant to help you prevent and manage your apnea and related conditions using a holistic, self-help approach. By focusing on the root causes of apnea rather than its symptoms, Dr. Rath discovered that this disorder is much like having allergies or asthma, but the effects come out at night–while trying to sleep. Her finding that certain foods and chemicals can trigger apnea, associated chronic insomnia, and restless legs syndrome (RLS) represents a significant departure from conventional medical practice. Thus her alternative method for treating this disease virtually eliminates the need for the CPAP machine, expensive dental devices, surgery, and reliance on prescription drugs. The timeliness of this book cannot be overstated, as the prevalence of apnea has grown considerably over the past 30 years, with 18 million cases recorded in the United States in 2008 and an estimated 28 million in 2012, making it one of the most widespread chronic and dangerous disorders today. Now you can learn how to manage your own case simply and reliably. You will learn the approaches, solutions, and remedies that worked for the author and determine for yourself whether these could work for you too! This website is best viewed using Internet Explorer 8 or higher, Mozilla Firefox, Google Chrome, or Safari.